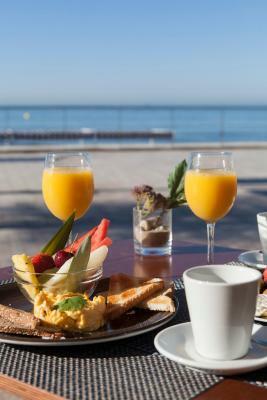 Lock in a great price for URH Sitges Playa – rated 8.5 by recent guests! Staff was friendly and helpful and the hotel was centrally located. Comfortable rooms. Good breakfast. 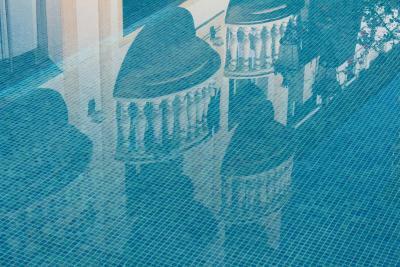 Nice pool and agreeable and accomodating staff. A couple steps away from beautiful beach. Enough room for a baby bed plus luggage. Stroller fits in elevator. Location location location. 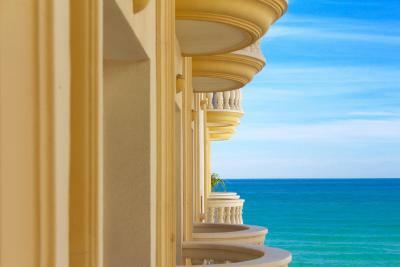 Book a sea view room as the balconies on the beach side are perfect for relaxing and people watching. Plus the hotel is so close to the beach and local bars/restaurants. It is the best area in Sitges. The location, friendly staff, comfortable room with the sound of the water, made for a very relaxing stay. Would stay here again. You can't beat the location ... it's perfect! So close to the beach and walking distance to all parts of town and waterfront area. Our room had doors that opened to a balcony looking out at the beach. It was very close to city center and top tourist attractions. The bed was comfortable and the linens very nice. Also, the breakfast buffet was extensive and delicious. 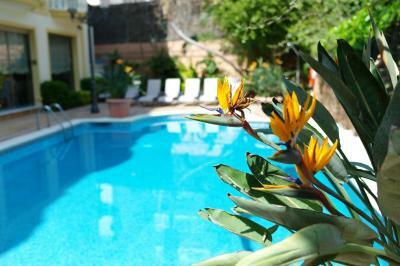 Great location in Sitges and very close to everything. URH Sitges Playa This rating is a reflection of how the property compares to the industry standard when it comes to price, facilities and services available. It's based on a self-evaluation by the property. Use this rating to help choose your stay! 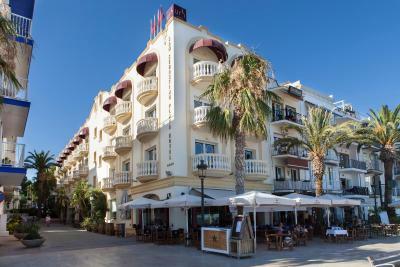 URH Sitges Playa is located on the beachfront of San Sebastian Beach, in a pedestrian zone of central Sitges. It offers a 24-hour reception, a terrace and an outdoor swimming pool in its garden. 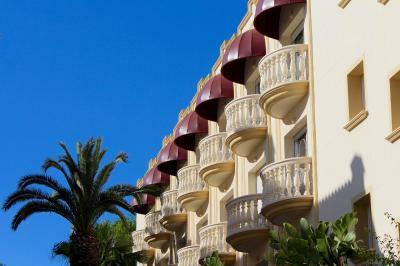 All rooms at the URH Sitges Playa include a private balcony and have air conditioning. 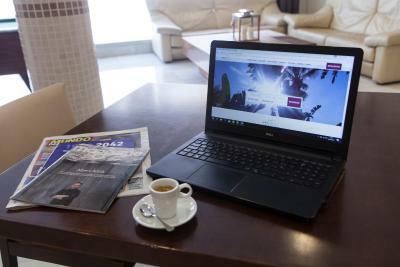 Each room features an elegant bathroom, a safe, satellite TV and free Wi-Fi. 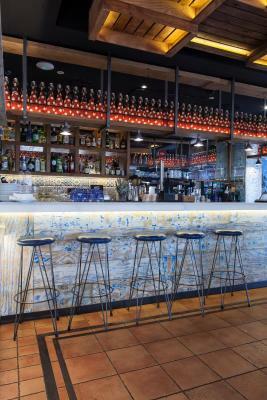 El Indiano Restaurant, serves a range of Mediterranean cuisine, including fresh seafood and characteristic rice dishes. Other hotel facilities include car rental and a tour desk. 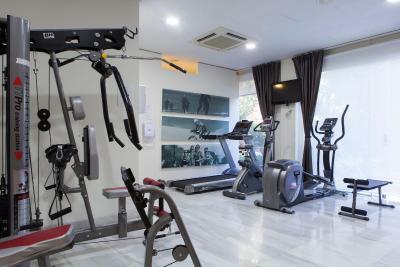 URH Sitges Playa offers a fitness center and a massage area, subject to availability. There is also an airport shuttle and on-site, indoor parking is available for a daily fee. 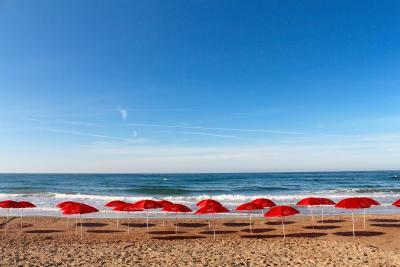 When would you like to stay at URH Sitges Playa? This room features a balcony with views of the hotel swimming pool and grounds. This room features a private balcony with views to the Mediterranean Sea, San Sebastián Beach and San Bartolomé Church. The room includes a parasol and beach towels. This suite has 3 private balconies overlooking the Mediterranean Sea, San Sebastian Beach and the church of Saint Bartholomew i Santa Tecla. There is a separate lounge. The room comes with a king size bed. A parasol and beach towels are included. This room features a balcony overlooking a quiet pedestrian street with palm trees. There is also a partial sea view from the balcony. This stylish room features a private furnished balcony with partial sea views. There is a kind size bed and the room comes with a coffee maker. Beach towels and a parasol are included. This triple room features a balcony with pool views and 3 single beds. The bathroom comes with bath or shower, hairdryer, and free toiletries. 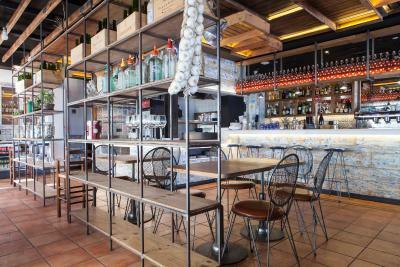 House Rules URH Sitges Playa takes special requests – add in the next step! URH Sitges Playa accepts these cards and reserves the right to temporarily hold an amount prior to arrival. Please note that, in case of early departures, the total amount of the stay will be charged. 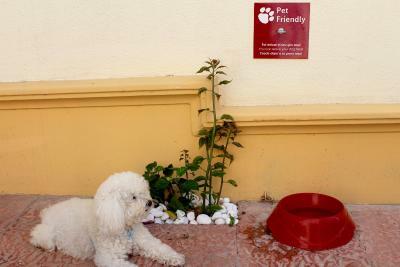 Please note that small sized pets are allowed on request at an extra cost. You can use the Special Requests box when booking or contact the property. Bathrooms are a bit tired but the overall experience was very enjoyable. Great food too. Lovely staff. Very enjoyable stay. Very friendly staff. Allowed us a late check out and up graded us to a beach front room. Perfect. We shall be back. Only annoying point is the TV that turns on automatically when you activate you room power with the key card. I had to unplug it to avoid that. The bath towels were a tad old (not super soft). Otherwise perfect stay! Awesome staff. Very friendly and professional. Good breakfast and perfect waterfront location. Location was very good but very old and dated no frills. 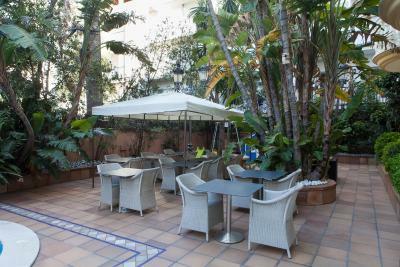 Location...facing SAN Sebastian beach....about a 5minute walk to the main commercial street. Staff: willing to assist. Room is pretty clean and just one minute to beach.